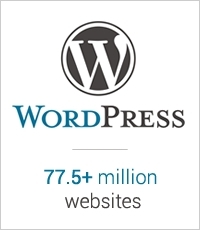 With its 77.5 million (and counting) websites, Wordpress is the world’s most popular blogging platform. But far more than blogging, Wordpress’s openness to coding and scripting means that, with a little creativity, many have created fully-functioning websites from Wordpress, which has made it a popular platform for techies and non-techies alike. Here we’re going to outline three pros and three cons of this web-design and blogging giant, to help you decide whether or not it’s the right choice for your project. Pro: Simple-yet-powerful Wordpress has a friendly user interface meaning that, as a blogging platform, more-or-less anyone is able to use it, regardless of technical capability. That said, however, with some knowledge of coding allowing you to take advantage of its largely open-source nature, a plucky little Wordpress blog is able to transform into an impressive, eye-catching website. In fact, a lot of official websites – such as that of Sony Music and Sweden’s official website “sweden.se” – use the Wordpress framework, and they look fantastic! Pro: Cheap For a simple blog with a “.wordpress.com” domain, you don’t have to pay a penny – it’s completely free. Optional upgrades such as enhanced themes may cost you a little more, but hosting your own “premium” site on Wordpress with its own domain will cost as little as £60per year which, when you consider everything else that Wordpress helps you out with, isn’t much! Pro: Large user-base and community There are 77.5 million individual Wordpress sites in the world, making it the web’s most popular blogging platform. It’s because of this that Wordpress can boast an enormous community of users with whom to share your posts with and, if you take the time to integrate yourself into it, can provide you with great insight into how to improve your own site and make the most of the technical workings of the platform. It’s also worth noting that, due to the aforementioned open source nature of Wordpress, there’s a whole host of community-created plug-ins to make your experience easier and more enjoyable. Con: Security Wordpress sites are notorious for being at a high risk to attacks from hackers. Although the future looks bright in this sense with each new version of Wordpress upgrading security features and overall integrity, this can also be its downfall; with the vast amount of Wordpress sites in the world running so many different versions, a lot are at risk. Ensure that you keep your version of Wordpress up-to-date. Con: Flexibility For those just looking for a blog and aren’t necessarily technically-minded, Wordpress becomes quite a basic blogging platform which would struggle to do much else. Unless you know how to code, Wordpress can offer you the bare basics: a blog which is caught between a few select themes with limited (user-friendly) options for customisation. Con: Customisation clash Despite its potential for plug-ins and customisation, if your site heavily relies on modifications, the fact that they’re homebrewed and likely to be from a number of varying, independent developers means that your plug-ins don’t always work together properly. For larger sites running on Wordpress, or if you want to moderate a project such as a web portal, plug-ins are essential, and getting them all to work together could involve some intricate technical work. Wordpress is definitely a powerful platform and is great for starting out; however, those aiming for a larger, more interactive site – perhaps one that also relies on user-generated interactivity – might want to reconsider their options, or consider going bespoke.